Alas, even as Canada and much of the US are broiling with record heat, the price of ice cream has gone up due to increases in the production of milk. ABC News reports that dairy products are predicted to go up by 5 to 6 percent in 2011, the result largely of rising costs for corn to feed cows. This has occurred due to “soaring crude oil prices and demand for ethanol, the corn-based gasoline additive,” plus rising corn exports to China, says Boston.com. Seaweed is not, of course, a substitute for milk in ice cream, but new research shows that it can rival milk as a source of “heart-healthy” substances. These substances are bioactive peptides, for which milk products are currently the primary source. New research in Journal of Agricultural and Food Chemistry has found that seaweed proteins function just like milk’s bioactive peptides in reducing blood pressure “almost like the popular ACE inhibitor drugs” which also prevent heart attacks and strokes. As Science Daily notes, seaweed and other “macroalgae” can also have a “medicine-like effect in treating or preventing certain diseases” and could be used as a “functional food” to treat and even prevent certain diseases. Many Americans are still more likely to associate seaweed with the strange green stuff that washes onto beaches and gets stuck around your ankles in the ocean. But seaweeds are a “rich but neglected alternative source,” eaten by people in East Asia and elsewhere for centuries: There is Nori — the black stuff that sushi rice is rolled up in, dulse in coastal Europe, and limu palahalaha in native Hawaiian cuisine. 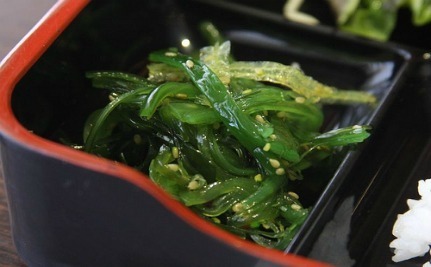 The benefits of seaweed have been widely touted; it contains vitamins B and a number of other nutrients, not to mention more calcium than milk. These findings are good news for vegans and those who have milk allergies or are lactose-intolerant, though one probably has to consume seaweed in greater quantities than in a California roll to take advantage of the health effects. Or perhaps you’d like to try this seaweed ice cream in Singapore — which, perhaps because of the heat, may be sounding surprisingly appealing. can't really mix chocolate in it. chocoseaweed! seaweed is really great for thickening hair growth, clearing heavy metals and providing a great assortment of minerals and other goodies. Kelp tablets are an easy way to get your daily seaweed!